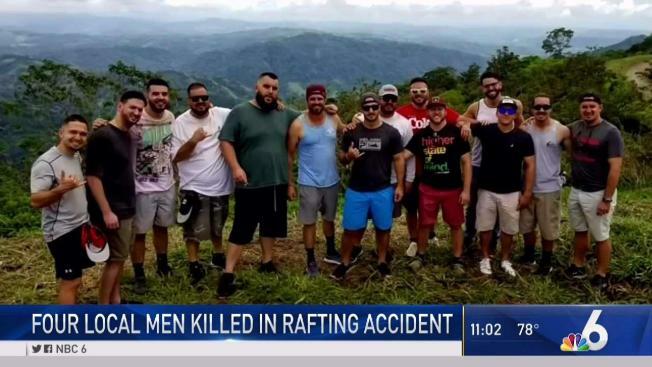 NBC 6's Laura Rodriguez has the latest on the investigation into the Costa Rica rafting accident that killed four men from Miami and a tour guide. Four American tourists and a Costa Rican guide were killed in a weekend rafting accident in the Central American country, authorities said Sunday. The men from Miami have been identified as Ernesto Sierra, Jorge Caso, Sergio Lorenzo and Andres Denis. They were in Costa Rica for a bachelor party. "What was meant to be a weekend to remember for 14 friends turned into a living nightmare," Chris Comas, who survived the incident, said in a statement. Three rafts flipped on the Naranjo river Saturday around 3 p.m. and the five victims were carried away downstream, according to Costa Rica's Judicial Investigation Organism. Other passengers managed to cling to the rafts and some were rescued by another guide in a kayak. "Throughout the dangerous ride down the river, all of us struggled to stay above water, swallowing lots of it on the way down as our bodies ricocheted against the rocks in the water while struggling to survive," Comas said. "Most of us were ultimately able to grab hold of rocks or barriers in or around the water and await the rescue teams to get to us." The local guide was Kevin Thompson Reid, described by his boss as one of his most-skilled guides. All of the victims died from asphyxia as a result of drowning, Walter Espinoza, the director of the Organization of Judicial Investigations, confirmed to NBC 6. The case is being investigated as negligent homicide, Espinoza said. The rafting company, Quepoa Expeditions, will also be under investigation. In total, there were 14 tourists aboard the rafts and five guides, officials said. Authorities said the river was swollen by rains and the National Emergency Commission maintained an alert in the area due to the possibility of flooding. The Americans arrived in Costa Rice Oct. 18 and had been renting a house in Playa Hermosa de Jaco, according to the Costa Rican government. The Red Cross said via Facebook that the rafts overturned near Liverpool de Quepos. Costa Rica President Carlos Alvarado expressed his dismay about the accident on Twitter. The U.S. Department of State confirmed the deaths. "We are saddened by news of rafting accident in #CostaRica. We can confirm 4 U.S. citizens died as a result of the accident. We extend our deepest condolences to their families and loved ones, and extend our gratitude to Government of Costa Rica for their support in this tragedy," U.S. Department of State spokesman Heather Nauert wrote on Twitter. Friends have set up a GoFundMe to help pay for funeral costs.